Jackie and I went for a nice walk yesterday, through the prairie and woods next to Winfield Village. We walked about four miles altogether. Toward the end of the walk I paused to retie a boot, and found that my back was really tight. Bending down caused pain in my sacroiliac joints. It was odd because it was a familiar sensation, but an old familiar sensation. I used to feel that pretty often on a long walk, but I hadn’t felt it lately. Without really thinking about it, I had attributed the change to general improvements in fitness and flexibility. But here after a fairly short walk that old pain was back again. I was briefly puzzled, but realized right away what had happened: Because the walk was going to be wet and muddy, I’d worn my old heavily lugged goretex hiking boots. These used to be my main boots; they’re the ones I wore on my 33-mile Kal-Haven Trail hike. I’ve kept them because I haven’t found a satisfactory pair of waterproof minimal boots, and I’ve worn them right along over the three or four years I’ve been transitioning to minimalist footwear, whenever I needed waterproofness or a heavily lugged sole. But they have the big downsides of non-minimalists shoes: Their thicker heel jacks up my posture, and their rigid sole keeps my feet from adapting to the terrain. It might not be just the footwear. The trail was muddy enough that every step was a bit of an adventure—my foot would sink into the ground, but it would sink a different amount each step, making it hard to establish and maintain a consistent gait. I wouldn’t be surprised if that didn’t play into making my back feel a bit wonky after a couple of miles. But clearly it’s time to retire these old boots and find some waterproof minimalist boots with sufficiently lugged soles to handle some short, steep hills on a muddy trail. I quit doing the monkey bars, probably when I was college age, and quickly lost the capability. Then for three decades would have been afraid to even try, because I’d definitely have hurt myself. 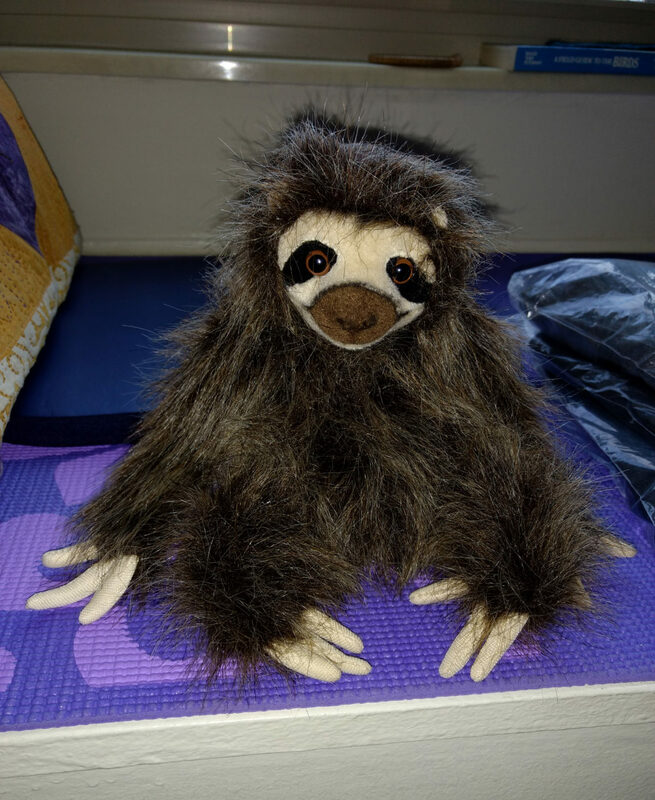 A few years ago I wanted to regain that capability, so I started looking for monkey bars to practice on, and found that they’ve gotten quite scarce. Many playgrounds don’t have them at all. 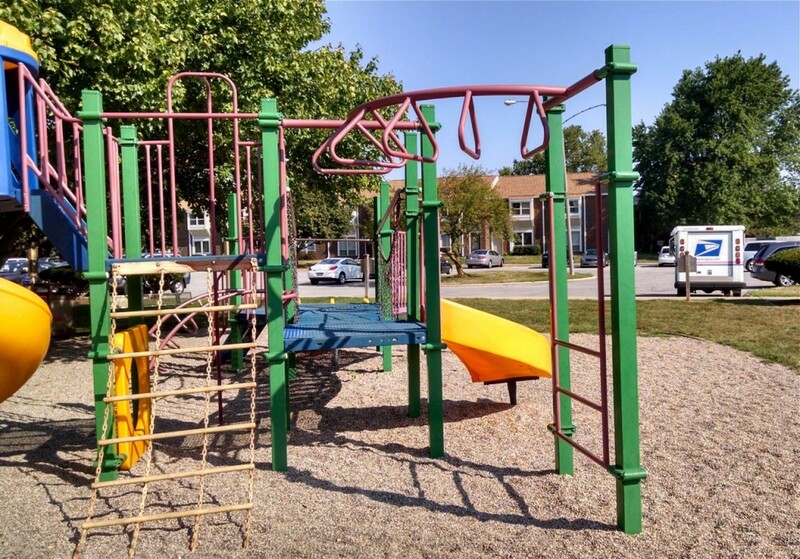 The reason for both the near disappearance and the switch to triangular bars seems to be that monkey bars are “dangerous.” Many playground safety experts recommend that monkey bars be excluded from playgrounds altogether, and I think the weird shape is designed to make them harder to climb on top of, in the hopes that kids would then not do so. I spent a chunk of yesterday afternoon at an “alignment play day” with folks from CU Movement (and kids), getting some hanging and balancing and barefoot walking on various textures. 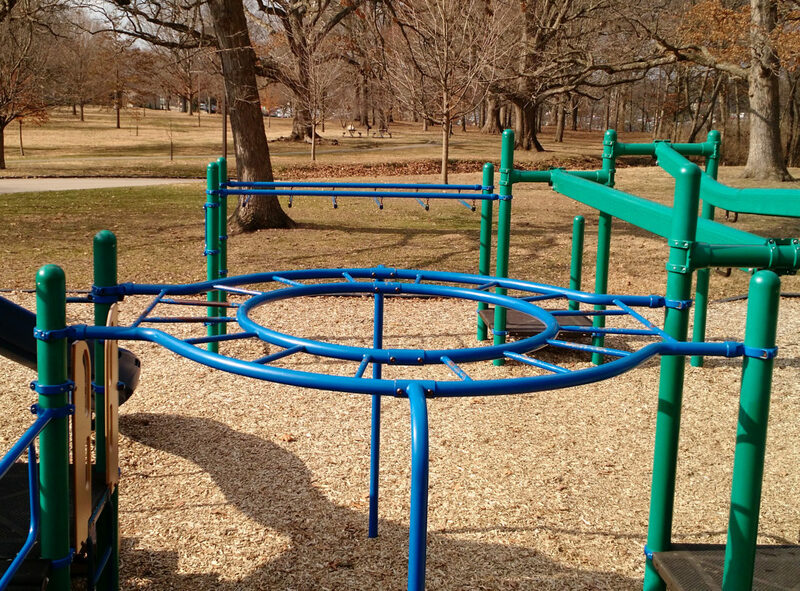 One thing I did was traverse the monkey bars at Clark Park in Champaign—an old-style set of monkey bars, rather like the ones I remember as a kid. One of the kids in our group—small enough that it was a challenge to reach the next bar, and at a height that the experts would no doubt claim was “too high” for a kid of that size—did the monkey bars, and then immediately wanted to climb on top of them. He asked for help getting on top, which his mom declined to provide—except that she pointed out that one of the supporting poles could probably provide the necessary foot purchase for him to get on top on his own. And he did manage to find two ways to get up there. Having gotten up there, he decided against traversing the top of the monkey bars, and simply swung back down under them. A new school of thought is emerging (finally!) that “dangerous” playground equipment offers valuable opportunities for kids to do exactly what this boy did: evaluate a hazard and decide how much risk was appropriate. The only way to learn to make that sort of evaluation is to actually practice it. Making playgrounds so safe that children cannot hurt themselves reduces their opportunity to develop a good sense for what is safe and what is dangerous, and what is and is not within their capability. It has also made it a lot harder for me to find a set of monkey bars to practice on. I crossed the monkey bars three times in the afternoon, but I forgot to attempt my next big trick: Cross from one end to the other, turn around (without putting my feet down) and cross back again. I’ll do that next time. Being a member of the Winfield Village Cooperative, I’m technically a home owner and not a renter. In fact, more then technically: I’m actually a home owner. On a day-to-day basis, living at Winfield Village is a lot like being a renter. I pay a monthly housing charge that feels a lot like a rent payment when I pay it. There’s an office staff that shows units to prospective new owners, and a maintenance staff to fix things (plumbing, appliances, etc. ), and keep up the grounds—all very similar to what you could expect at an apartment. But there are differences, and most of the differences are luxuries. There are a few differences that are financial. For example, I’m entitled to deduct my share of the property taxes and mortgage interest that Winfield Village pays. One that I hadn’t thought of before was made especially apparent to me a few weeks ago, when a friend mentioned having to sign the next-year’s lease for his apartment, and I was reminded what an annoyance that always was. Every year when we used to live at Country Fair, we’d get a call from the office asking if we wanted to renew our lease for the following year. Every year the rent went up a little, which was just to be expected. More annoying was that every year we had to read the new lease. Most years it was the same or nearly the same—the office staff would go through and indicate changes—but we still felt like we ought to read it, because we’d still be agreeing to any changes that the office staff failed to point out. I think twice there was a complete re-drafting of the lease, so we had to read it all the more carefully. Even years when it was still (mostly) the same, after we read it we then had to go through the whole thing with the office staff, because there were a dozen places we had to initial specific provisions, and then we had to sign three originals. Until my friend brought it up, it hadn’t occurred to me that I haven’t had to go through the whole stressful lease-signing process for three years now! Instead of a lease, I have an occupancy agreement. That agreement hasn’t changed in three years, so I haven’t needed to re-sign. The housing charge hasn’t gone up either. And because it’s a co-op, I’ll have a vote on any major changes that do come up. Ah, the luxury of ownership. 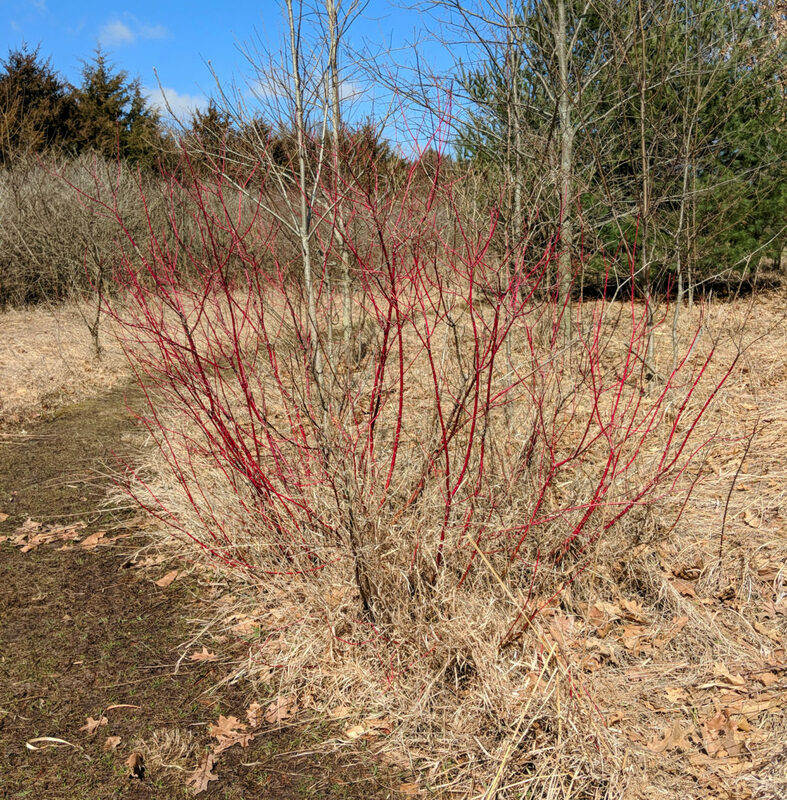 The guy who has been leading the stewardship effort for the patch of prairie right next to Winfield Village is looking to transition some of the effort to someone who lives here, and I have expressed a willingness to take on some of the stewardship tasks. 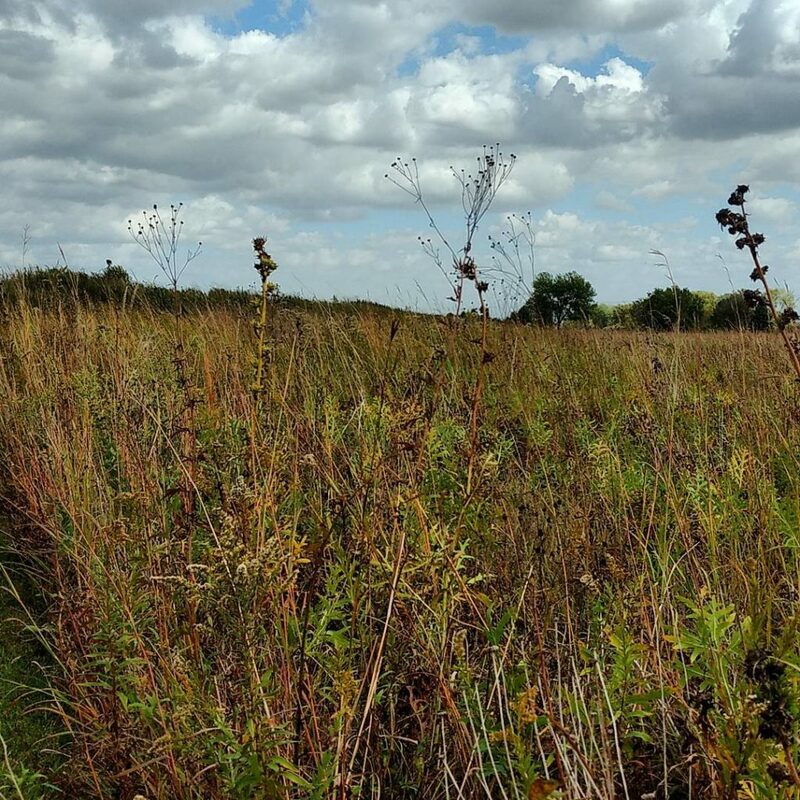 This would primarily consist of working to remove non-prairie species, together with using the prairie for education, and advocating for the prairie when other people imagine some other use for the land. But one essential step with maintaining prairie land is occasional burning. I could probably manage the rest of it, but I’m certainly not qualified to do a prairie burn. 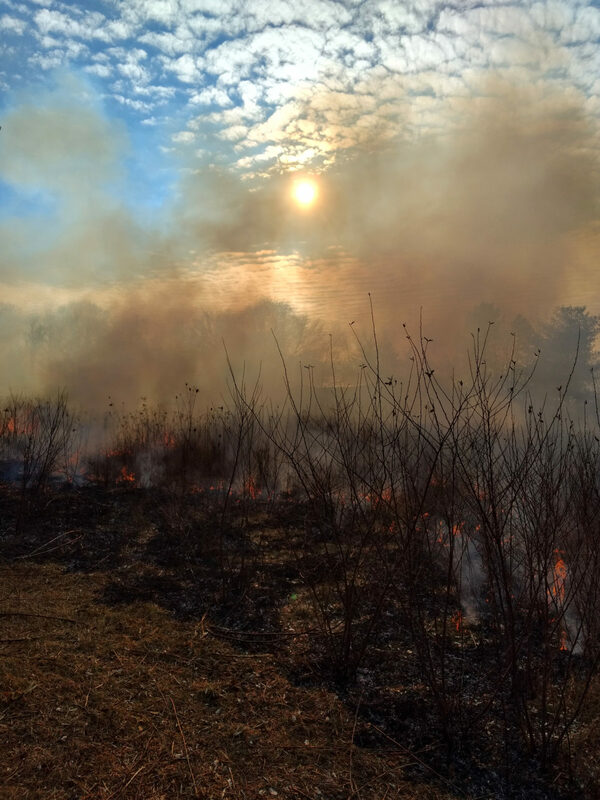 To start to remedy that, yesterday I participated in a burn at a small patch of prairie land near Urbana, managed by a guy from Pheasants Forever. I had told him of my interest in learning to manage a burn, so he talked me through what he did as he did it, explaining the thought-process behind where he started and what he burned, and also introduced me to the equipment involved. The patch of prairie we burned was 1.5 acres, and took a little over an hour to burn. I neglected to get a picture of myself taken while I was dressed in my Nomex coveralls, but above see a nice picture from the burn itself, and below for an older picture of our own little patch of prairie. I just took my own first yoga class! I’d meant for years to study yoga and hadn’t managed to make it happen, but this week the stars aligned: one of my neighbors is a yoga instructor and is starting an outdoor class right here on the lawn at Winfield Village. 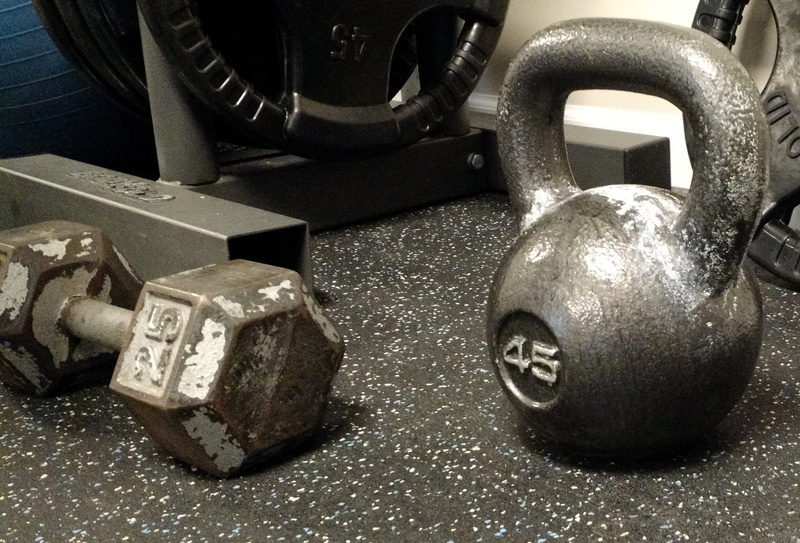 Some anonymous benefactor donated a 45 lb (20 kg) kettlebell to the Winfield Village fitness room! 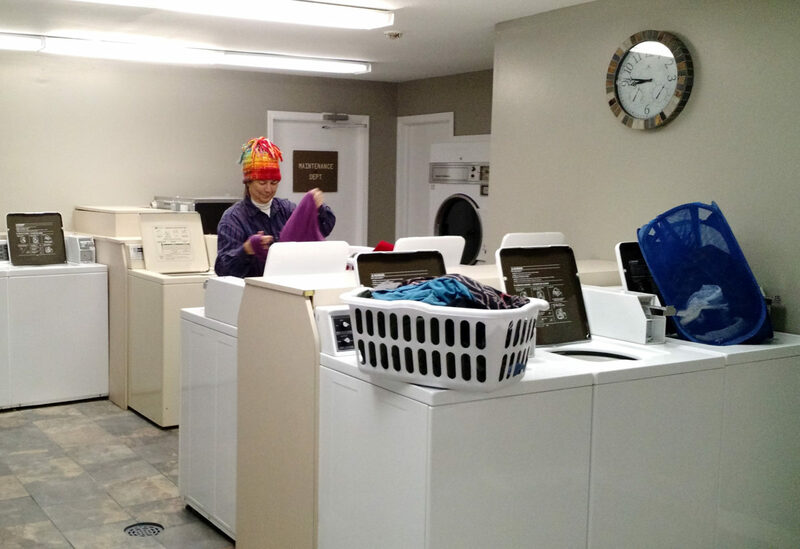 The Winfield Village laundry room is open again, after having been closed for a week to put in new flooring. There’s a dearth of good walking routes from Winfield Village to Champaign and Urbana. From west to east, the choices are Prospect, Lyndhurst/Fox Drive, Neil/Route 45, First Street, and Race Street. The first two are okay if we’re heading to western or central Champaign, but are pretty out-of-the-way if we’re headed to campus or to Urbana. The latter two lack sidewalks and entail long walks along busy roads, which makes them pretty unsatisfactory. A few weeks ago, I saw a pack of cross-country runners turn up a rather faint double-track on this side of the railroad, which alerted me to the fact that it’s possible to go that way. 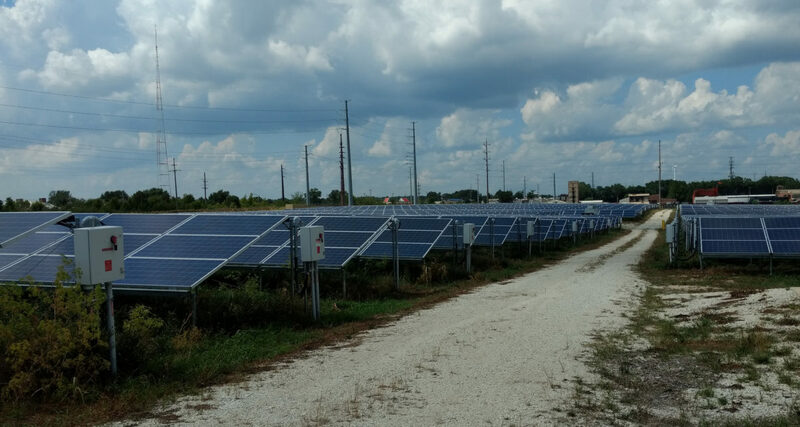 I was doubly interested in going that way, both as a possible alternative route north, and because about one mile north of us there’s a large installation of photovoltaic panels that the University has been calling its “solar farm,” and this bit of double-track leads right to it. The track runs along the west side of what seems to be research crop fields for the University, although that bit of it may be an easement to provide access to a recently constructed line of pylons for some high-tension power lines. 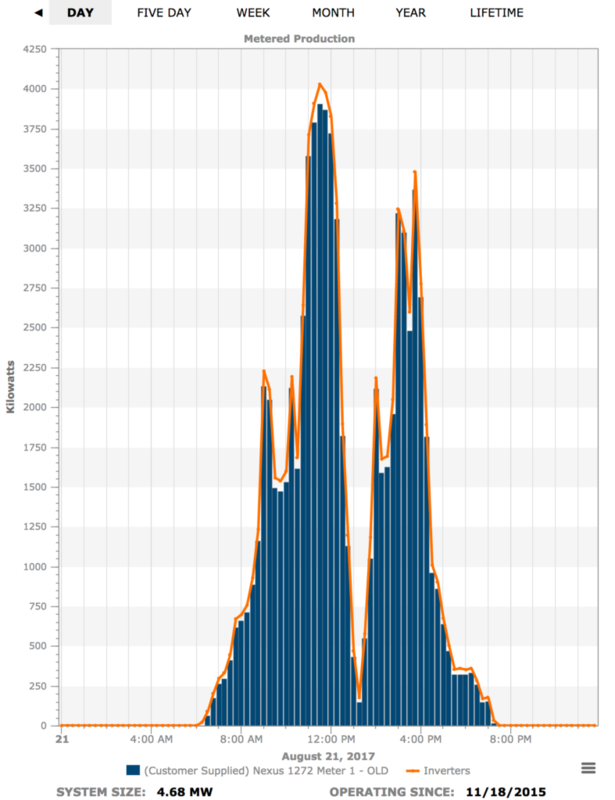 The solar farm seems to producing quite a bit of electricity on sunny days like today. 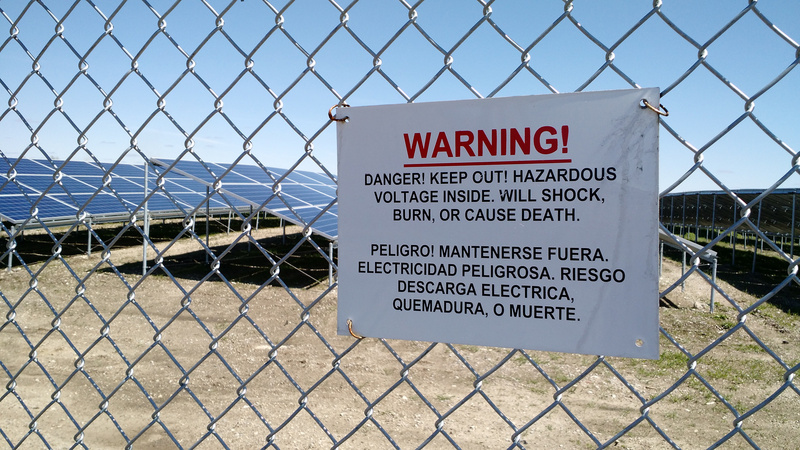 Having walked to the solar farm we turned east. Having come that far instead of having to walk a mile along First Street, we only had a quarter of that distance to cover before we reached Windsor and were able to get on a proper sidewalk. We took a nice tour around the more obscure corners of the research park, including a little diversion past the Fire Service Institute’s training facilities. Then we crossed Route 45 and made our way down to Schnuck’s to pick up a couple of groceries and head on home. Total walking was 7.7 miles, in my case added to a 3.5-mile morning run.